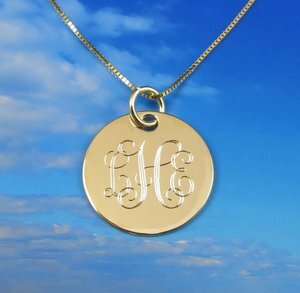 This 14K solid gold engraved personalized monogram necklace pendant is hand cut out of solid 14k gold 24 gauge sheet and measures 3/4" in diameter. The interlocking monogram has a great traditional look, other fonts are available upon request. Your choice of 16" or 18" 14k solid gold chain shown in photo can be purchased separately for an additional $150.00. A message can be added to the back for just $10.00 more. Please add to your cart the necklace titled Added Customized Message" $10.00. It can be found at the top of page one of my shop. Then include message in the notes to seller box.